This past month, I have been mostly indoors keeping warm because I don’t like to Welsh windy weather, I’m concerned I might take off with the size of my ears, so myself and my cat sibling Mr Tiger Feet have been sitting for hours in the kitchen pantry looking up at the jar of Pero dog biscuits and the tubs of treats…what a beautiful view. There was a big jar of Pero Cat biscuits there too, but one of my other 6 sibling cats (Peepo) decided to scale the shelves and knock down the jar…let’s put it this way you’ve never seen such a frenzy of cats scoffing biscuits in such a small place. As always, I’ve been promoting the Pero dog treats to other dogs when I’m out and about. Last week I think I may have converted a mud covered poodle at the Big Rock Cafe in Porthmadog. My human took out the treats out of the bag and this poodle suddenly appeared, sat down and barked for a treat (seriously cheeky). Poodle’s human came over and appoligised for poodle’s rudeness (I should think so too). Anyway to cut a long story short….Poodle went away very waggy tailed with a napkin full of Pero Dog Grain-free Treats with the Pero website written in biro on it. 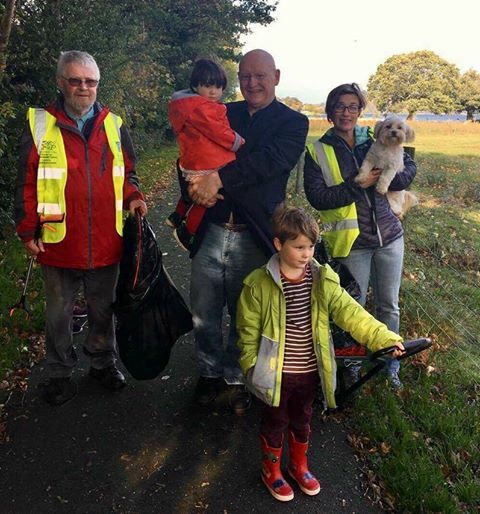 On my last litter picking duties with Llanberis Tidy Village, we were joined by a MP and his children, obviously he just wanted to meet me and not see the awesome work this is Community group has done over the past few months.